Read to know how hedging your Option and Future traders can help protect your capital. Note: Expiry Day Today For November 2016 Options and Futures. Please Close All In The Money Options and Futures of Current Month. Today is expiry day for all options and futures expiring on 24-Nov-2016. Please make sure to close ALL Options and Futures trades. All Options expiring today, whether Buy or Sell, if In the Money (ITM) by 3.15 pm please close them at the best rate possible. You may or may not close Options that are Out of The Money (OTM), buy or sell. You can let them expire worthless. This will save you brokerages and STT (taxes) involved. Since they will expire worthless they will be ZERO so no need to close. If you do not, you will save money. All Futures expiring November 2016, whether Buy or Sell, by 3.15 pm please close today at the best rate possible to avoid being closed by the broker or the risk management team. They close at market rates and you cannot do anything about it. So please close yourself. People who have done my course must be tension free today as they are least bothered about expiry. For conservative traders like us there is nothing called tension as far as trading is concerned. Moreover there is nothing as greed also, as we are happy even if we make 2-3% profit a month. 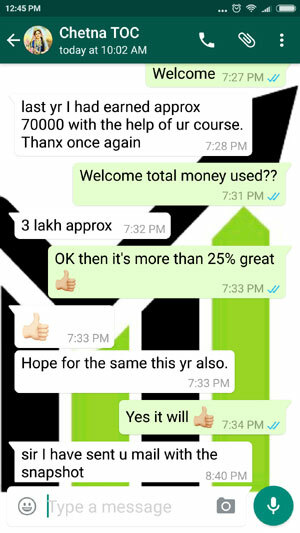 They have learned through the conservative strategies in my course, proper hedging methods that keeps their money safe over the long term. Even if there is a loss it is at most 2% of margin blocked. On top of that there is Strategy 2 to recover most part of that money lost or even make a profit. A lot of people say why don’t you keep losses in your testimonials pages. The reason is pretty simple – losses are there but rare so why keep it. Any way I am not like others that I will hide the losses. 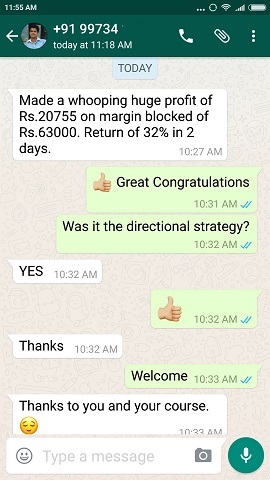 Here is one loss trade, but see yourself how happy he is even after the loss, as he recovered it almost all, in Strategy 2 at a time when the markets were going through a lot of Volatility and movements and when directional traders were counting their heart beats when everything they were doing was going wrong. Before seeing the below image let me tell you one thing clearly that there is no strategy in the world that can guaranteed 100% times profits always when traded. And there is no way to manage a trade and turn a loss making trade into a profitable one. If someone is telling you that they have a strategy that guarantees 100% times profits it is a plain lie. 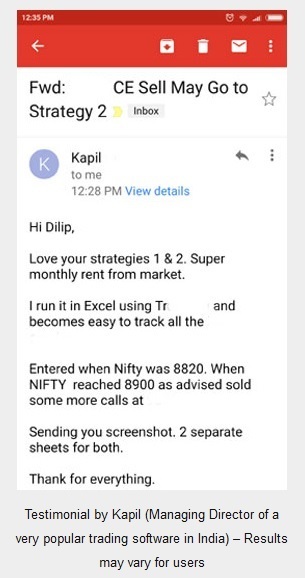 Risk is always there in trading the stock markets, but a strategy is good if it makes money over a period of 6 months no matter how many losses or profit percentage is there in that trade. 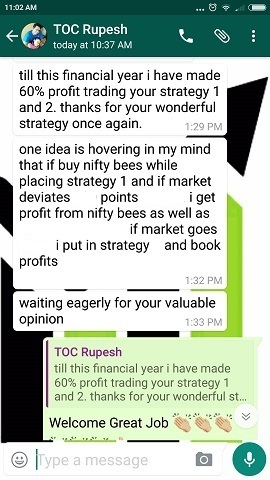 If in 6 months you have made a profit trading that strategy at least 6 times consider it to be a good strategy. So losses will be there but over all it should show a profit after trading at least 6 times. Click here to read why managing a trade or adjusting a trade does not guarantees a profit. Here is one very important information for traders doing directional trades thinking they will make a lot of money very soon: Only one person knows what will happen tomorrow. He is called as GOD. We are humans, oh sorry – ANIMALS. How much ever we study about future, we cannot predict what may happen tomorrow, even for our own life. I request you to shed your ego and become a non-directional trader. Take your call it is your money, but I care for you, else my course fees would have been 30k and people would have still paid. Fortunately Gods have given me the extreme power to control greed. No, I am not saying that money is not important and you should not try to make more. You should, but always take the right path to make money not the wrong direction. The right path to success in increasing order – is patience, persistence, knowledge, hard work and humbleness. If you take the wrong path, you may see small success pretty soon, but that’s called beginners luck after that destruction will take over, and you will start losing money fast. One recent example is the demonetisation effect which has already gripped our country. I am sure there must be lakhs of people who have not slept well since our Prime Minister announcement of demonetisation of Rs. 500/- and Rs. 1000/- notes. Years of illegal money made turned into a piece of trash within seconds. Black money holders were rich before 8-November-2016, from 9-November-2016 they have become middle-class or poor. This is what wrong path can do and an attack can come either from Gods or from laws or by your own foolish or greedy mistakes. Earning money in stock markets is not different. Name me one greedy option trader who only bought options and became a millionaire in one year. There is NONE and there will NEVER be ever one. Learn to make money slowly and become a millionaire in a few years, or, try to make money fast and lose all in few months the choice is yours. 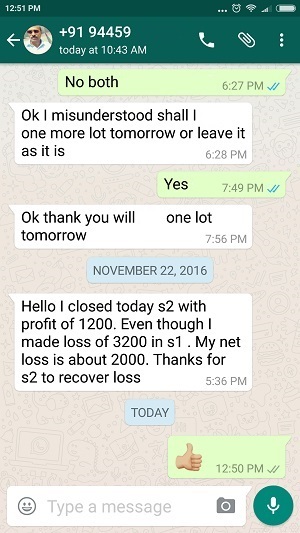 I was in the “make money fast” group of loser traders from 2007-2010 and lost more than 7 lakhs (100% of my savings gone). I then took a job and a loan to survive with a pregnant wife at home who also left her job as she was 8 months pregnant then. Imagine my situation. And I hope you understand now, why I left greed in 2010 and turned to books and knowledge seeking. Today I am not even in the “make money slow” group. 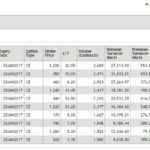 I am in the “make money very slowly but compound it safely” group, and believe me I am very satisfied and happy with the results. This is called living a rich life. Rich life is not about how much money you have in your bank account or in your locker. Rich life is about how much least bothered you are about money and how much time you have to enjoy a portion of your money without ever feeling guilty of spending it on things you love and when you want to spend it. Rich life is doing what you want to do and when you want to do without taking permission from anyone. Of course I always do good things in my life. I do not even smoke to hurt others. We do not buy anything we do not need even if it comes with a huge discount, but we buy anything that we need without looking at the price tag. This is what earning and spending money in the correct way can do. There is no tension in life at all. 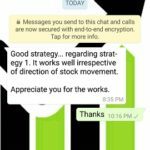 Hope you understand the benefits of trading with hedging and not trying to trade the direction to make a lot of money but actually losing a lot of money. What is real rich life. ‘ Read to know how hedging your Option and Future traders can help protect your capital. ‘. ‘ Read to know how hedging your Option and Future trades can help protect your capital. ‘.